3.75 cm long not counting the ear hook .femine earrings with beautiful work. 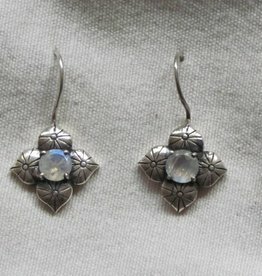 five nice rainbow moonstones set in gold on silver hang under the main body of the earring. Hand faceted rainbow moonstones. Material is silver with an electroplated gold layer.